Delia Ferguson offers exclusive accommodation in a quiet and secure environment and has been extending a warm welcome to all her guests since 1995. 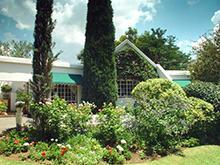 Rutland Guest House is centrally situated between Hyde Park, Rosebank, Randburg and Sandton. The delightfully decorated guest suites are set in a beautiful garden away from the main house, each with it's own courtyard and with spacious en-suite bathrooms. All the suites are well appointed, with tea/coffee making facilities and complimentary sweets, biscuits and a fresh fruit basket, everything to make our guests happy. We do our best to make your room available for you at the arrival time that suites you. If you wish to occupy your room after check-out time and we can accommodate you, there will be a small charge as agreed upon. The two bedroom cottage has a wonderful country feel with wooden floors and large windows looking out onto trees and garden. There is a small private courtyard garden and fully equipped kitchenette. It is perfect for long stays, corporate contracts and families in transit. The cottage is fully equipped and can be taken on a self catering basis. The main bedroom has a queen size bed, the second bedroom has two single beds. The "Orchard" family suite has two twin beds, a large table separating the sitting area with a pull out double bed sleeper couch. Having a fridge, microwave and plenty of space it is ideal for a longer stay. The "Sky" room has a queen size bed. This fresh blue and white room has a surround of hand painted ivy leaves. Delicious breakfasts are served in the guest dining room overlooking the garden and home cooked evening meals are on offer by arrangement. The sparkling swimming pool is there for the enjoyment of guests.